Some context is in order here. Rachael is a Goddess of the Federation. The Federation is the name for the independent nation of many worlds that exists on the astral side of the universe. My dream group friend Kevin, who is extremely advanced in astral projection, helped found it long ago and projects into it during the day while other members of his system take a turn in participating in physical life through his body. Kevin has provided this sigil that Rachael and he created that corresponds to a place in the Federation. 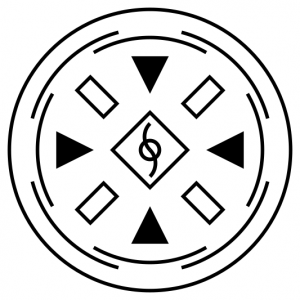 If I focus on the sigil in a lucid dream, and get it accurate, it functions as a beacon for Rachael or the transit goddess Inzami, or whoever else is available, to locate me, and one of them will be able to open a portal through which either she can project into my dream or that I can walk through to enter the Federation. Kevin is usually asleep in his own dream world at night. See Kevin’s site, the Miaii System. I’m assuming this is all true and accurate as I try to work with it, because that’s the only way to approach things like this, to give it a good effort and see what happens. Too much skepticism, in my opinion, is not intelligent or scientific. It’s limiting and cowardly. It also doesn’t work. Too much skepticism creates a process doomed to failure, particularly in these nonphysical realities where confidence and doubt have a huge and immediate influence over my control and abilities. True exploration is putting yourself out there, pulling up anchor, and seeing how far you can go down the rabbit hole. There is no sense in hanging onto beliefs about the structure of reality when we are exploring unfamiliar areas of reality. The below posts chronicle my attempts with the sigil. Three Quick Astral Experiences – Too Much Sleep to Keep Them Going?